Another try at the entry level Beocenter model, and slightly more convincing than the earlier Beocenter 2002. By now, many B&O models featured a grey finish, and so did the 2200, which made its lowly position in the range seem less obvious than the plastic wood trimmed Beocenter 2002. 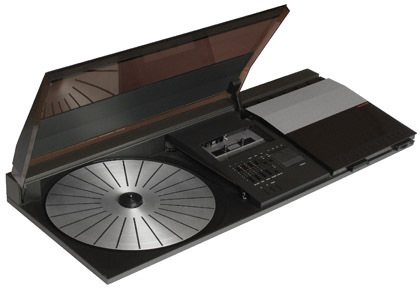 A new turntable, mechanically similar to the Beogram 1800 and with a stylish new anti-static platter, certainly made Beocenter 2200 look attractive, and the use of the same tape transport mechanism as the Beocord 2000 and 5000 was encouraging. Also initially interesting were the main controls, a strip of identical slim black pushbuttons whose presence or function was not clear until the set was turned on, and the long, discreet slider volume control, also typical B&O, or so it seemed. The cabinet was even inlayed with large expanses of aluminum trim, and looked slim and quietly expensive. Text copyright © Beocentral. Unauthorised reproduction prohibited. Had B&O succeeded in producing a low cost Beocenter worthy of the name? No. Behind the clever detailing and admittedly well executed styling was just another dressed up Japanese music center, with similar strengths (the turntable) and weaknesses (the rest) as the earlier Beocenter 2002. Playing records with the MMC 5 pickup wasn’t too bad, but even through the special X 25 loudspeakers (only available with this model) which were quite small, the sound was heavy and thick, an excess of loudness correction (which could not be turned off) at the lower end of the volume range being the main cause. The cassette and radio were worse, the cassette section in particular demonstrating that there was more to the high performance Beocord 2000/5000 machines than just the deck. Even the cabinet did not stand scrutiny, for the plastics and finishes were of lower grade than would be expected, and the controls did not give an impression of high quality either. Text copyright © Beocentral. Unauthorised reproduction prohibited. In many ways this machine was more disappointing than the previous Beocenter 2002, as from a distance it seemed to promise so much. It is arguable that the poor performance of these models damaged the reputation of B&O to impressionable first time buyers, who expected something special but ended up with something ordinary. Text copyright © Beocentral. Unauthorised reproduction prohibited.